James Baldwin pointed out repeatedly that racism is a white issue. In the US, only white people can end the 400 years of racism against black people. 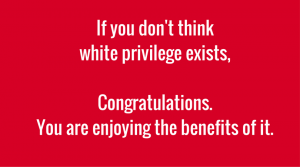 To that end there has been talk of coming to grips with white privilege. This would be an important first step for white people to engage in, to recognize their privileged state This can then lead to concrete efforts to undue the embedded racist structures in our society. Recently I ran across a 1990 article “White Privilege: Unpacking the Invisible Knapsack” by Peggy McIntosh. Though some of the privileges she lists are the obvious ones, like to having to worry about DWB. I found it enlightening about some dimensions of my own privilege. How Much Money Would It Take To Eliminate Poverty in the US? Gay Marriage – how did this transformation occur? October 7, 2014 politics Comments Off on Gay Marriage – how did this transformation occur?